I first heard about the book, Where’d you Go, Bernadette by Maria Semple, through an article on the NAMI site about books with characters with mental health issues. I want to read all the books on the list, but I choose to read Where’d you Go, Bernadette first because it seemed like Bernadette might have some similar mental health symptoms to me, which made me want to read about her. 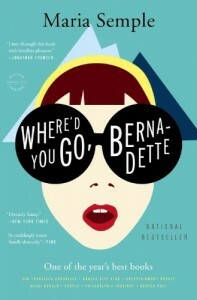 Where’d You Go, Bernadette is about a woman named Bernadette who moves to Seattle with her husband Elgie and a few years later has a daughter named Bee. Bernadette used to be a famous architect, but suffered some kind of mental break around the time of the move and hasn’t built or designed anything since. Since moving to Seattle, Bernadette has become very anti-social, panics about everything, and doesn’t like leaving the house. When Bee asks for a trip to Antarctica as a reward for getting perfect grades at school, Bernadette begins freaking out at the thought of being stuck on a cruise ship with other people. In the lead-up to the trip, Elgie realizes how bad his wife’s health has become so he stages an intervention with a psychiatrist, but Bernadette mysteriously disappears during the intervention. 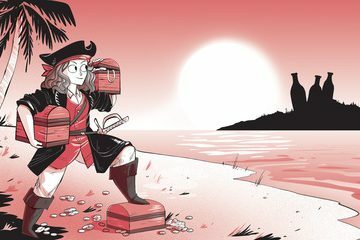 Bee takes it upon herself to find her mother by creating a book of documents related to her mother’s disappearance and her life in Seattle and L.A. Overall, I thought the book was enjoyable. It reminded me a little bit of a tamer Gone Girl. Both books have a huge mystery that seems impossible to untangle and they switch between the points of view of the various characters, slowly revealing the true meaning behind certain events. This is a book that is hard to put down. I stayed up too late multiple times because I could not stop reading. I liked that the minor characters were well-written. The other mothers at Bee’s school start out as very self-obsessed and you can’t help hating them. Two of those mothers, Audrey and Soo-Lin, have character arcs that eventually reveal other sides to them. Also, it turns out that Bee somehow gets lot of documents, such as FBI files and letters from a psychiatrist, to create her book that she should not have had access to. I wasn’t sure how Semple would explain how Bee got the documents. I won’t ruin the explanation, but I will say that I was very pleased with how that plot point resolved. My only complain plot-wise is that I felt the book wrapped up a little too neatly. Several major decisions and problems were magically solved at the end. But the aspect of the book that I want to focus on in this review is the way mental health is portrayed. I have mixed feelings on the mental health aspects of the books. There were parts that I identified very deeply with and other parts that I wish the book had done differently. In terms of aspects of the book I identify with, Bernadette’s urge to run away definitely tops the list. Some days, life is just a lot of work and nothing seems to be working, and running away feels like the solution, even if it isn’t really. Bernadette also has a lot of anti-social tendencies and really only leaves the house when her daughter needs her to. I also have a tendency to not want to go out and do things, even though I know it’s not good to isolate myself. Sometimes a body at rest just wants to stay at rest even when it really shouldn’t. At one point in the book, Elgie describes the house he and his family live in. When Elgie and Bernadette bought the house it was not in good shape. When Bernadette to neglected to fix it up as planned, the house slowly became worse and worse and is basically unlivable when the book starts. However, the family doesn’t notice how bad their house has become. Elgie says that since they were living in the house, the small changes happened slowly and became normal, which made it harder for them to notice anything was wrong. I think this happens sometimes with mental health and with life in general- you don’t always notice something is off because it’s what you’re used to. My first bout of depression was in 9th grade. I didn’t even notice anything was wrong until it was over. It was just the way it was. In 10th grade I suddenly noticed that I wasn’t sad all the time. I was so used to the sadness that I didn’t notice that it wasn’t normal to be sad all the time. Thankfully, I have gotten much better at noticing when my feelings are headed toward a depressive or anxious state. I think it’s important to work on this kind of awareness so you can try to take action before your (metaphorical) house becomes unlivable. Now, for the part of the book that I didn’t agree with. I felt that Where’d You Go, Bernadette didn’t do a good job of portraying the treatment and recovery aspects of living with a mental health condition. The first character I want to talk about is Kyle, a classmate of Bee’s. Kyle is always acting out at school and he is doing drugs. After an encounter with the police, he is sent to a drug recovery program and given a diagnosis of ADHD and borderline personality disorder. Since Kyle is a teenager, his mother, Audrey, has control over his recovery and she makes what I feel are some questionable decisions. Audrey chooses a very harsh wilderness recovery program in Utah specifically because it is the only state that allows you to basically kidnap your child. In addition, the treatment program is described as rehab, which sounds like it is focused on drugs, not mental health. I did not like that Audrey chose such a harsh program, especially since Kyle’s mental health was not being treated. And since Kyle disappears from the story shortly after entering the rehab program, the readers never find out anything about his recovery or treatment experience. Bernadette has a different idea about recovery that involves no treatment. At the end of the book, she discovers a new, challenging architecture project. As soon as Bernadette gets the idea, she suddenly realizes that all of her bad, destructive behavior needs to end and she is completely committed to making her life and her family’s life better. While it’s awesome that Bernadette has a passion project she can concentrate on, that alone can’t and won’t solve her problems. Bernadette has great intentions, but motivation and follow-through can be very difficult with mental illness- it’s there one day and gone the next. I wish Bernadette had made some kind of commitment to see a therapist or psychiatrist or both. That would have made her plans much more realistic and reasonable. Between these two examples of recovery and treatment, I feel that the book did a disservice to successfully living with mental illness. Kyle and Bernadette both have destructive behaviors and need to be treated, but the complexities of treating mental illness is not addressed, and as a result, the book does not set up the characters’ future in a realistic and practical way. I would recommend Where’d You Go, Bernadette. Although it has a few shortcomings, it is well-written and an enjoyable read.